Scalise As House Speaker? "I Wouldn't Rule It Out." As we noted last week, the buzz about Paul Ryan quitting as the Speaker of the House in Congress has been growing, along with the buzz about Louisiana’s own Steve Scalise, the current House Majority Whip, ascending to succeed him. With one arm snaked around his crutches and the other gripping a handrail, Steve Scalise climbed gingerly up hundreds of stairs to the peak control room of a hulking oil rig 77 miles off the coast of Louisiana. Scalise doesn’t have feeling in his left shin, and he can barely flex his left foot because of nerve damage caused by the bullet. His internal organs are still recovering, and he’s expecting to undergo another surgery in April. “It’s hard to make lateral movements right now, but if the ball came to me right now, I could get it. I could make the throw to first base … without falling over,” Scalise said, standing up and swooping down to demonstrate fielding an imaginary ground ball. POLITICO noted that the Reno Gazette Journal article last week in which Rep. Mark Amodei was quoted predicting Ryan would be leaving as Speaker within 30 to 60 days has come under dispute, in that Ryan’s office said he won’t be going anywhere in that time frame, but there is a continuing and building amount of discussion that a change in the Speaker’s office is becoming imminent. Scalise says he’s not going to run for Speaker unless House Majority Leader Kevin McCarthy, with whom he’s a close personal friend, declines a run. That’s what many think is going to happen. McCarthy has a political problem surrounding a fairly open secret on the Hill; namely that he carried on an extramarital affair with a then-colleague, Rep. Renee Ellmers (R-North Carolina). Ellmers lost re-election in a 2016 primary race to George Holding. Talk about that affair got in the way of McCarthy’s succession to replace John Boehner as Speaker in 2015, and lots of folks think it will be a similar problem when Ryan finally quits as well. Scalise doesn’t have a political problem like McCarthy does. The worst thing anybody thinks about Steve Scalise is that he gave a speech in 2002, when he was a state legislator howling about Louisiana’s lousy tax policy to every constituent within earshot, to a group billed as a neighborhood association which might have included some David Duke supporters. 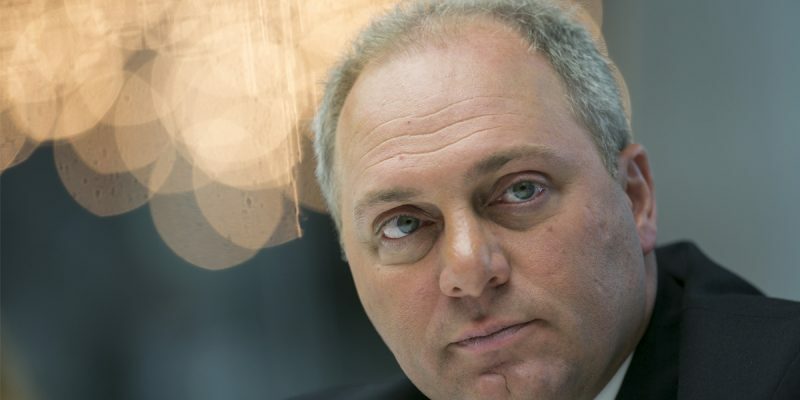 And while that might make Scalise a Nazi in the eyes of left-wing propagandists like Lamar White, nobody else thinks it matters – especially when Cedric Richmond, who represents the New Orleans area in Congress along with Scalise and currently chairs the Congressional Black Caucus, and is no particular peacemaker when it comes to issues involving race, vouched for Scalise’s goodwill. Should Scalise emerge as a candidate for Speaker or win the election for the post, it will be interesting to see what circumstances the fond relationship between the two would create in terms of being able to make deals on policy. The long and short of it is that Steve Scalise is very likely to become the next Speaker of the House. We just don’t know what the timeline for that will be.